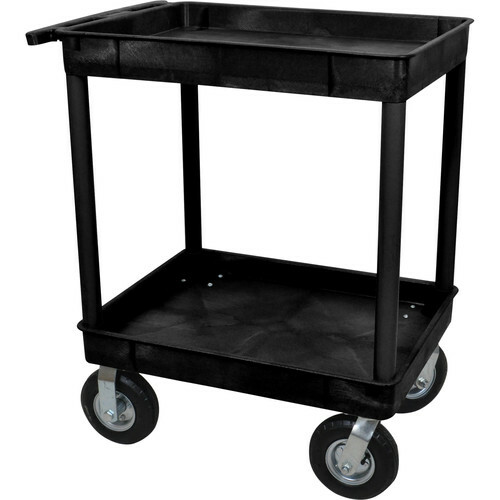 This black two shelf service carts features big 8" pneumatic wheels ensuring a shock absorbing, cushioned ride as well as smooth and quiet operation. 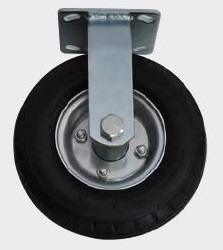 Ideal for outdoor use and bumpy warehouse floors, or noise sensitive environments such as hospitals and hotels. Bottom piece came in damaged.. not good packaging material. Vendor did ship another Bottom piece but when we put it together realized the top was damaged too! We fixed it the best we could without having put in another claim. Advantages: Customer service was good as far as sending out replacement product. Disadvantages: Had to do a lot of tweeking to product to get it just "good enough"